I am using a set of TX 35 DHT sensors, the connection to FHEM is implemented using a JeeLink v3c USB device. I will describe that in a different post, also how you would pair the sensors with FHEM – for now, let’s just pretend that was done. I use to define my FHEM Objects “manually” in the fhem.cfg file – so here is the definition for the TX 35 DHT on the patio. As you can see, the sensor itself is a LaCrosse sensor, connected to my JeeLink device (called myJeeLink). The sensor is called pt.Temp – the prefix pt standing for patio. If you do not only want to display the current values but also would like to gather historic data (e.g. for graphs), you will have to log the readings somehow. The easiest way is shown above – using a FileLog device. However, if you work with multiple sensors and record the data over a long time (which is the intention) than working with filelogs is not really the brightest thing to do: they are slow and they will use up your diskspace…quickly! So let’s try and get this right stright away: instead of logging to a file, let’s log to a database. Sounds complicated? Maybe – let’s find out. And of course, you will have to update this with our own database name, host, user, and password information! 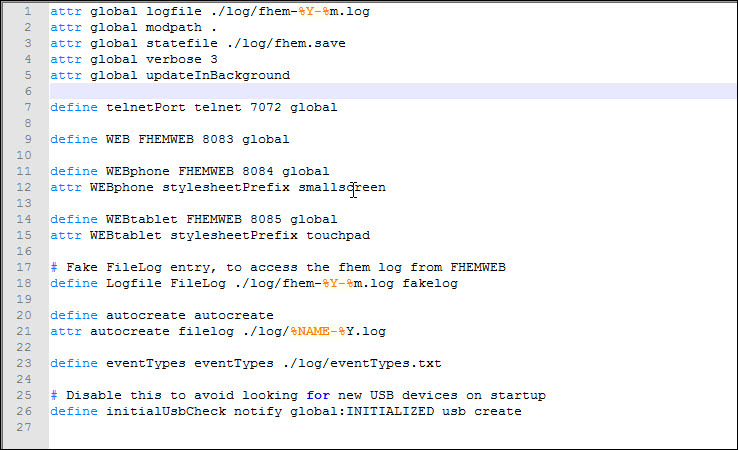 This defined a Device logdb of type DbLog with the configuration file db.conf in the FHEM home directory and it logs… everything. 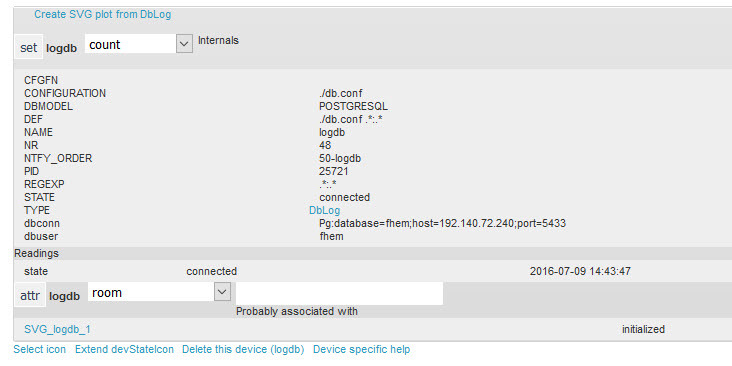 Now that we have connected the PostgreSQL Database sucessfully, it is time to return to the creation of the individual sensors. Remove the batteries from the TX 35 DHT if there are any installed. It has a set command for LaCrossePairForSec – enter 60 for 60 seconds and click the set button. Once you refresh the FHEM Interface, you will see a LaCrosse tab on the left. 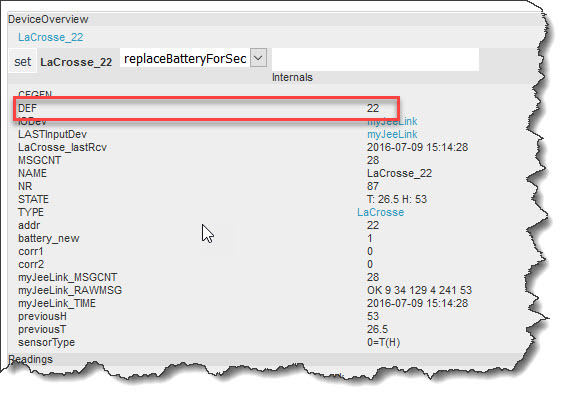 Select the Sensor and note the DEF value – that’s your Device ID! If you want to edit your fhem.conf file manually (like I do), this is the ID to work with for that particular sensor! 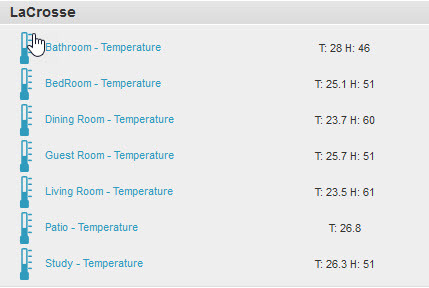 I am actually repeating this for a total of seven sensors – one of them, the one on the patio, is an older model that does not do humidity. But the TX 35 DHT are marked as indoor use so I will keep the outside one for the moment. So above is the list of all sensors in FHEM with their respective readings… and they are busily dumping their values into the PostgreSQL Database 🙂 – so far, so good. For now, one last thing remains to be done: the constant logging of each and every value reported (as an event) quickly fills the database with garbage. I am only interested in those events that indicate a change to the previous status. And luckily, FHEM supports this out-of-the-box: by setting the object’s event-on-change-reading attribute to . * we will only see those value changes come up.. the “clutter” in the Event Monitor dies down dramatically… and that’s it for the moment, let’s gather some data in the logs. The web page itself is available but of course, nothing is configured into the system yet. Before we start working with FHEM, here is a brief discussion about how FHEM is organized. In FHEM, it’s all about one file: fhem.cfg. This is the central configuration file which contains all – all! – definitions for the system. You can edit it directly or you can interact with the system using the Command Line and the configuration file will be updated in the background. After the initial installation, the file contains some configuration already – how you edit it, is up to you. I have chosen to use WinSCP and got the file local onto my PC, then used Notepad++ to work with it. 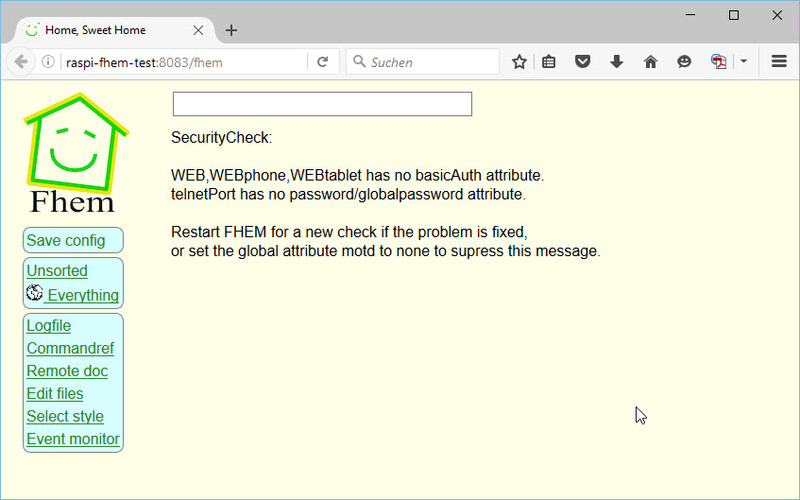 In FHEM, everything you may want to work with, is considered “an Object”. It does not matter what exactly it is – a device, a log file, a room, a setting – everything is an object. 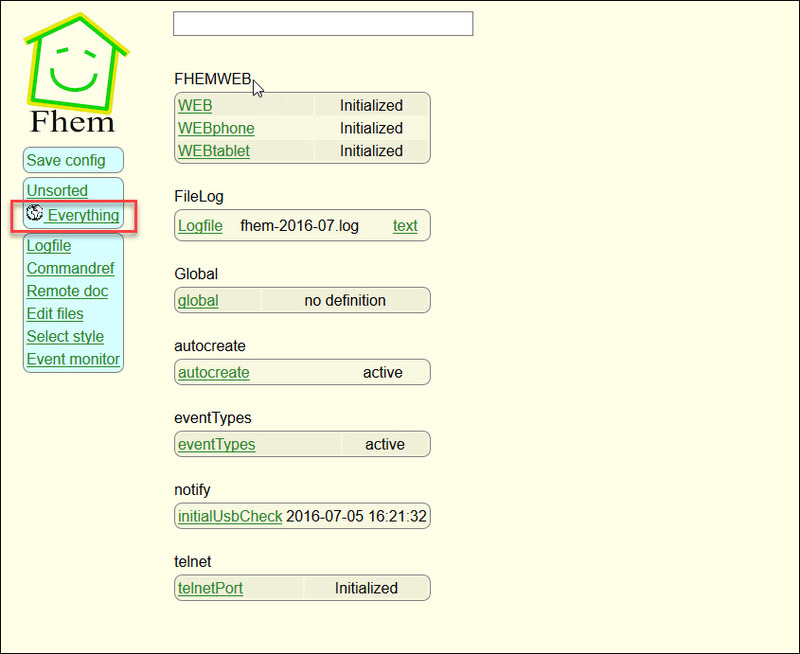 With the default installation done, you can already see some objects in FHEM’s inventory – just select Everything on the left to see all objects that are currently defined – and their status. Through the Command Line, it results in an immediate creation of the Dummy Object – but only “in memory” – mind the “Save config” entry on top of the menu bar! 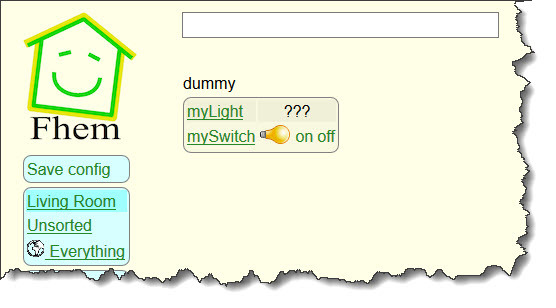 You can see that the object has a Name (“mySwitch”) and a Type (“dummy”). Those are the two parameters we have provided in the define command above. It also has a couple of other elements – sucha s a Number (or “Nr”) and a State (currently “?? ?”) but these we did not define – they come from the system and are defaulting to initial values or are auto-calculated. 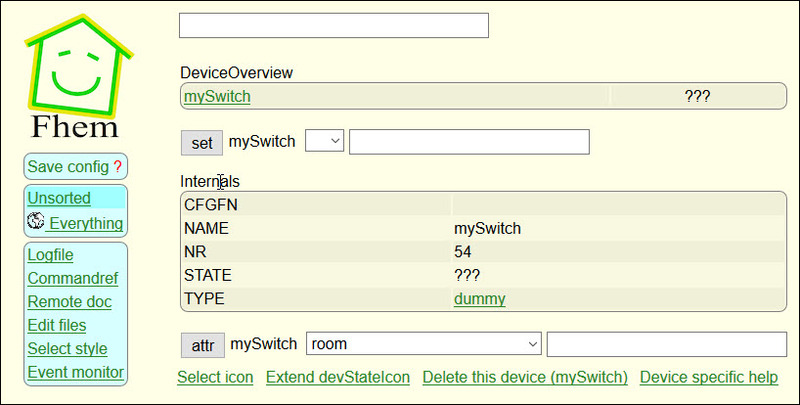 At the bottom, you can see that an Object has Attributes – in the screenshot above, one is defaulted (“room”) but others are possible. An Attribute is used to provide additional information to an Object. It typically describes the object in more detail. 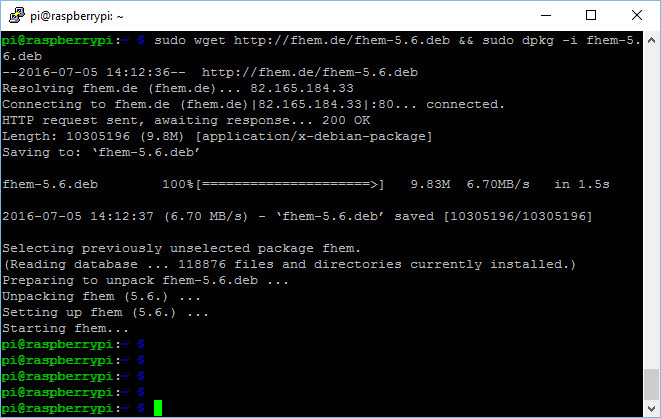 This time, I have chosen to update the fhem.cfg file directly and bring it back to my Raspberry Pi. Just copying the file back, however, does not help – FHEM does not “read” the updated configuration – you need to restart the FHEM Server. 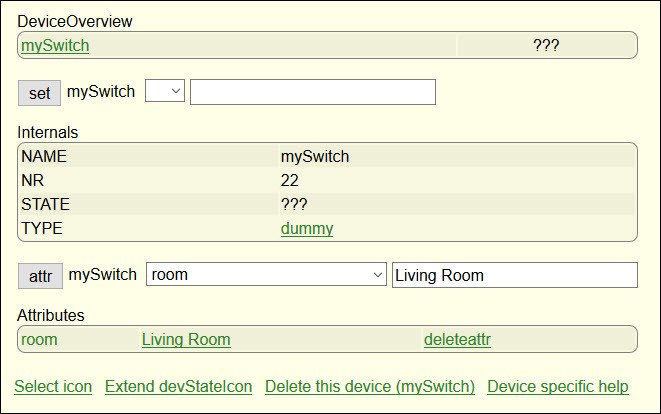 Examining the Dummy Switch more closely, you can now see that the Room attribute has been added – and that FHEM is using it in the menu to separate the devices by rooms. As you can see, the new dummy “myLight” is defined (Line 44) and placed in the Living Room (Line 45). At the same time, I have extended my existing switch “MySwitch” to include a command (can be “on” or “off”) to actually “switch” it (Line 41). 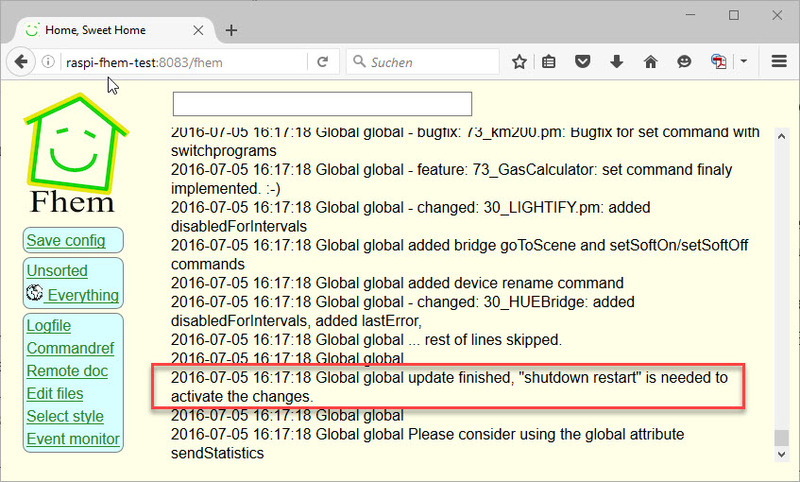 Instead of “hardcoding” the values of the event triggered by mySwitch (“on”, “off”), we are reacting to simply every event – every time mySwitch changes state (and invokes the Notify Object) we are doing something to myLight. The trick is using $EVENT (mind the uppercase style!) – that is a system variable that takes the value of the initiating object’s event (e.g. “on”) and by setting it on myLight, we can get around with one line of code. But that only works if the values are the same on both sides! 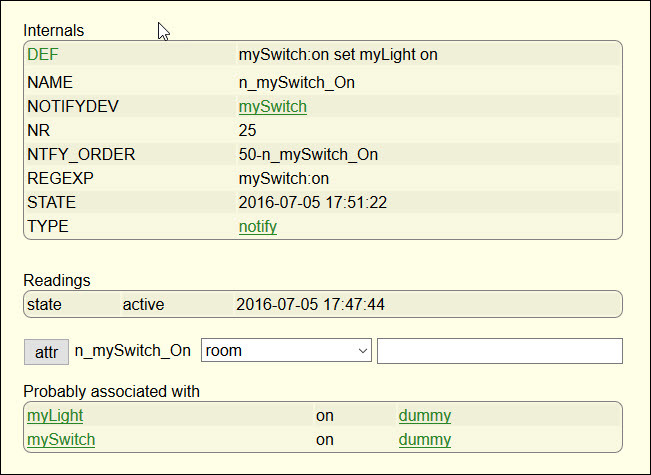 Not bad for a first attempt – we now can edit the configuration file, create devices, place them in rooms and have them interact based upon events. Next up is some cool stuff I always wanted to do… building my own weather station & indoor clima monitor. Like any other piece of software, FHEM needs updates. New devices may be supported or bugs may be fixed or new functionality may be added. So it is wise to keep the system up to date but at the same time, do so with care and the ability to roll back in case something goes wrong or requires more work to be done than you might have at the moment. The first rule before any update is to have a backup of the system. For FHEM on a Raspberry, there are two ways of doing that: the probably most complete one is to backup the entire SD Card using a tool such as the USB Image Tool. That simply backs up the entire system and you can restore the environment as a whole should something go wrong. Of course, if you have other environments or need to transfer the configuration between say a “Test System” and a “Live System”, you might want to choose a different approach. Typically, the file resides on the Raspberry Pi’s File System in the location /opt/fhem/Backup. 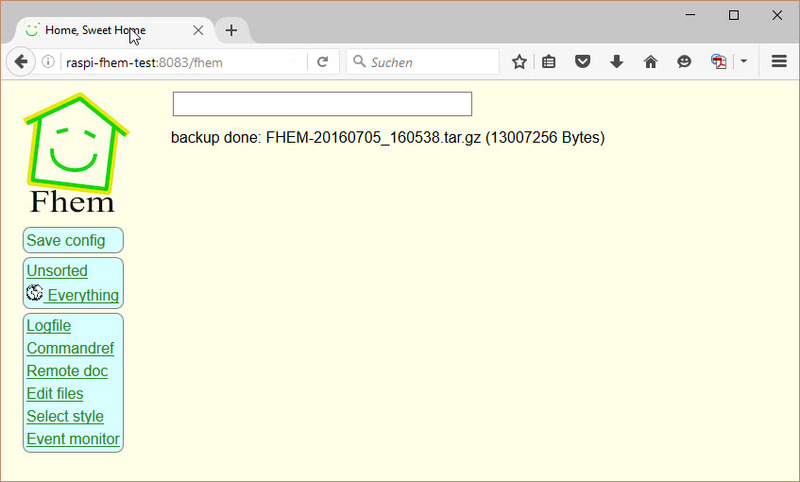 Like the backup, the update is invoked via FHEM’s Command Line – guess what command? The update loads a complete file list first so no worries if stuff starts to scoll through. Theoretically, the last message should inform you that the update has been performed, in my case, you really had to read the output as this was not the last line. Home Automation is getting more and more attention – and devices become more and more available for prices that are affordable. So time for me to start looning into it. In combination with a Raspberry Pi, this is a neat way of adding some geek stuff to your home that looks impressive and might even help you save some money and/or increase your comfort level. Considering “things to do” with a Raspberry Pi almost automatically sparks the idea of using it for some kind of home automation. It is small, it is cheap, it is extensible, it has a huge community and it can do the job. I have an “old” Raspberry (a Raspberry PI Modell B Rev 2.0, 512MB model) sitting around that I can use as a test environment – that is trying stuff without messing up my actual “live” Home Automation Server. If things work, I can then transfer them to the live environment. And maybe some more that I forgot to mention… but since this is about playing with a Home Automation Server, I guess I just leave it at that and install one. Let get around this quickly: I have just chosen FHEM – there may be other solutions, there may be better solutions – this is the one I am going to play with. like with any other solution, it needs to be installed first. But first, the Raspberry itself needs two more little bits sorted out. You will receive a graphical interface to select the region first, then the city. 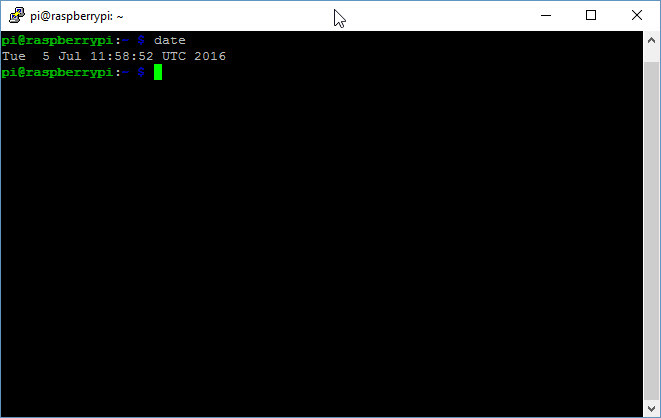 Upon confirmation, you will see the updated configuration in the shell. This might take a moment – at least my Raspberry Pi is not the fastes anymore. Note the port: it is 8083! 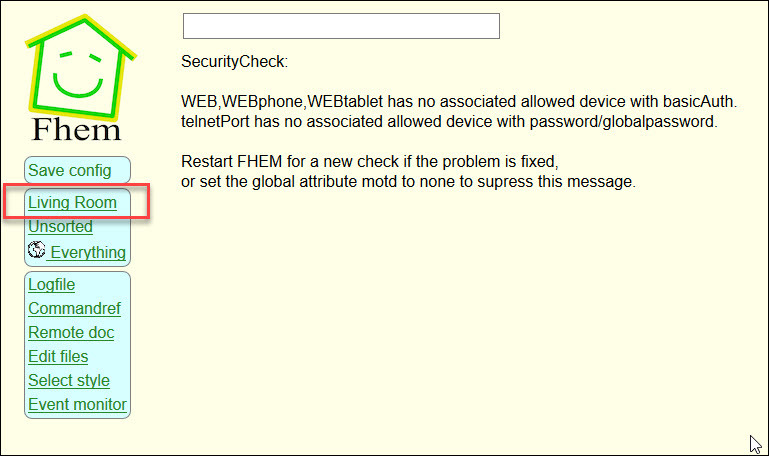 If you see the above page, you should be all set to continue configuring the FHEM Server. Okay, this is going to be interesting. So far, I’ve been one of the many blog authors that used to type that texts. Now, with my right slightly unusable, to put it at best, I had to look for an alternative. It is actually not the first time, that I have tried voice recognition software. In the past, however, to no satisfactory result. But plenty of time has passed since the last attempt. So yesterday I did a little bit of research on the Internet and as it seems, there is a sole provider for voice recognition software out there. So went to their website and check if there would be a demo version. There was none. So I contacted one of their salespeople to see if there is any way for me to try out the software before buying it. Their response was that there would not be a demo version but they completely would refund the sales price if I would not be satisfied. Needless to say that that was good enough for me. So I went ahead and purchased the software which is, for the record, Dragon Naturally Speaking 13 Premium. The installation was seamless even though Windows 10 is not officially on the list of supported platforms. Also, I had no problem to use my existing microphones with the application. Playing around with it a little bit, I found out that there are certain limitations in the interaction with the operating system but as long as you are able to perform a few mouse clicks you should not have too much of an issue with that. Most of my texts are either written in the web browser or in Microsoft Word. So I tried worked first. Dictating long texts – in English or in German language – proved not to be an issue at all. It in fact is naturally, much more so than typing. The initial voice-recognition is already quite good yet the correction feature which is also controlled by voice recognition is so powerful, that I barely find it necessary to type anything on the keyboard. Sometimes the software does not pick up the proper word but I would be able to spell it and even train it on it. I admit that that sometimes is too tedious so I might simply type it in. Typically, it is then picking up the new word correctly. That works in Microsoft Word as well as my web browser, some applications, which are not supported natively, can be dealt with we had the built in dictation box from where the text can then be pasted into the target application. So the next couple of days I will have enough opportunities to test the software a little bit more. But even with the limitations that I’m facing at least for me this is a big step forward. And by the way: this whole article has been dictated, not a single word was typed.